Blue! Orange has always been my favorite. P-body (referred to as Orange by GLaDOS), is Atlas' tall and wiry partner in testing, and is one of the two playable android Test Subjects built by GLaDOS for the Cooperative Testing Initiative in Portal 2, which was devised to phase out human testing. Gameplay-wise, P-body is played by the guest of the Co-op session; the player that receives an invitation, or the second player on a home console in split-screen mode. 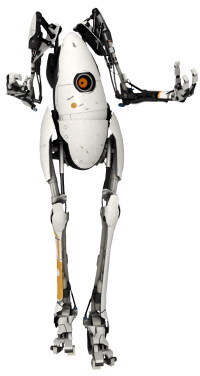 P-body is an orange eyed Core with a design similar to that of a Turret, and is portrayed to have somewhat less masculinity than in Atlas - if not a hint femininity. GLaDOS had created the Cooperative Testing Initiative after her awakening in Portal 2, as a means of replacing Chell as her only Test Subject. Along with Atlas, the two bots are pitted against a series of tests built by GLaDOS herself, utilizing the many different mechanics previously encountered by Chell from the game's single-player campaign. It was later revealed by GLaDOS that Atlas and P-body's Cores are programmed specifically to do nothing more but tests. During the final phases of testing, GLaDOS reveals that, while the Cooperative Testing Initiative has its uses, she needs human testing for science, not robots. GLaDOS reveals that there are humans locked away, deep within the ancient Aperture facilities. There the bots will be tasked with navigating the old test chambers and unlock the massive vault containing the humans, seemingly kept in place by some form of cryogenic storage. By doing this, they 'save science'. However, almost immediately after the robots unlock the room containing the test subjects, they are destroyed. They are eventually rebuilt and, during the credits, Atlas sits at a computer desk and watches P-body playing on a conveyor belt. Both P-body and Atlas are voiced by Dee Bradley Baker. P-body image from the official Aperture Science Collaborative Disposition Test. P-body icon from the official Steam Portal 2 group. P-body eye icon from the official Steam Portal 2 group. Blueprint of P-body on a shirt. P-body on a poster with Atlas. Prerelease screenshot of Atlas and P-Body. P-Body kind of resembles GLaDOS herself, meanwhile Atlas looks like Wheatley. This might be the reason that P-Body is GLaDOS's favorite android. P-body appears momentarily in the single-player campaign. Upon arriving in Wheatley's Test Chamber 15 where he "makes the exit", P-body can be seen in the newly created area watching Chell, before panicking and running through the exit. It is possible to access this area through a glitch before Wheatley moves the wall, but P-Body does not move and is not a solid entity. P-body, along with Atlas, makes two cameo appearances in LEGO Dimensions. This page was last modified on 24 November 2018, at 14:24.